In 1939, a team of workers beneath the Vatican unearthed an early Christian grave. This discovery launched a quest to discover the burial place of the Apostle Peter. From earliest times, Christian tradition held that Peter was executed in Rome by Emperor Nero and buried on Vatican Hill. But his tomb had been lost to history. Now a small army of workers embarked on the dig of a lifetime. The incredible story of the 75-year search and its key players has never been fully told — until now. The quest would pit one of the 20th century’s most talented archaeologists — a woman — against top Vatican insiders. 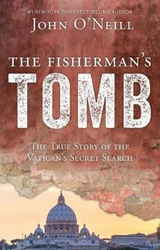 The Fisherman’s Tomb is a story of the triumph of faith and genius against all odds.